It’s so nice to feel loved especially on special occasions such as Valentine’s Day. Love is manifested in so many ways. And on Hearts Day, we usually show it through sending flowers with a special note to our loved ones. This is my inspiration for selecting the “Bouquet of Roses” & “With Love From Me to You Heart” images in creating my Valentine’s Day card. I’ve wanted so much to try creating vintage cards. Thus, this is my 1st attempt on making one. I made use of various techniques from distressing, inking to stitching by hand for these are the 3 usual go-to-techniques in achieving a bit of vintage feel on any of your creations. 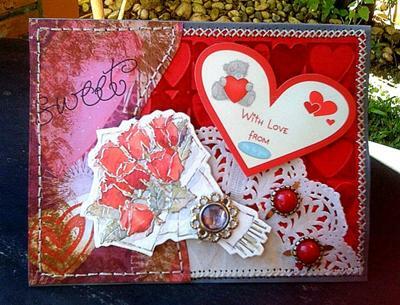 With the proper materials, tools & equipment, you’ll find making vintage cards easy-peasy. Red & Gray Cardstock: Star Paper Corp.
Gem Brads: All About Scrapbooking/Filstar Distributors Corp. Prepare your doily: Cut your doily in half. We'll just use 1/2 of the doily. (You can have your doily misted or you can apply ink on it). I chose to spread drops of coffee on my doily. Set aside to dry. gray cardstock. Adhere on center of your gray cardstock with double-sided tape. 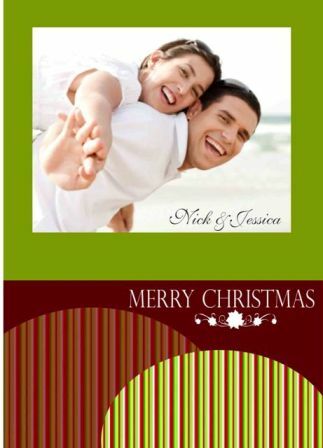 Make sure that your gray cardstock borders your embossed red cardstock. Collect your dried doily & adhere on the bottom-right of your embossed red cardstock. Prepare your Valentine-themed patterned paper: Cut a portion of your pattern paper to cover the left side of your card. Shape the right side of your trimmed pattern paper in a wave-like curve. Apply ink on your shaped Valentine-themed patterned paper: First, smudge Antique Linen Distress Ink near the edges. Then, dab Gathered Twigs Distress Ink with just plain tissue paper - again, around the edges. (You may opt to use an ink applicator.) Let dry. Adhere dried pattern paper on the left side of your card. Now, position and pop-up your (2) images on your card using mounting squares. Glue Gem Brad Accents on desired areas: The white gem brad on the “Bouquet of Roses” image. While, the (2) red gem brads as doily accents. As a finishing touch, curl the outer decorative edges of your doily (the part which is visible only). You can call me Kath. I've been scrapping and cardmaking, or should I say papercrafting, since September 2010 only. And I have been enjoying my new-found hobby since then. I would still love to try new styles and techniques in crafting and wouldn't hesitate to share these with everyone. You can find me at my blog, Creo by Lady Katutz where I share my creations. Hope you could drop me a line when you visit. This is gorgeous! I love the deep rich colors. Beautiful card! love all the little details!